The reoccurring theme of the College of the Mainland Foundation Student & Donor Appreciation Luncheon on Thursday, March 8 was Thank You. 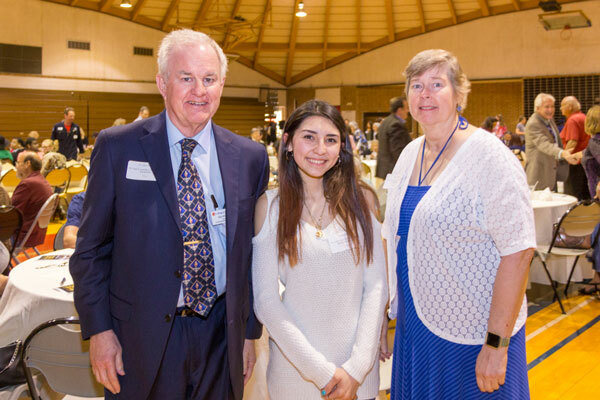 The luncheon held in the gym brought together 170 students with the donors who contribute money to provide for the scholarships. Seating at the luncheon paired up donors with their respective scholarship recipients. For Dr. Gary E. Wilson, a COM history professor, he and his wife, Diane, established a scholarship as a way to pay it forward since a number of people helped them with their educational endeavors. COM student Elodia Mejia was one of three recipients who spoke of gratitude for receiving a scholarship. She was the recipient of the Dr. Gary E. and Mrs. Diane Wilson Endowed Scholarship. The scholarship, she said, allows her to continue her studies and paves the way for two siblings to also go to school. In all $229,225 in scholarships was awarded to 263 students enrolled at College of the Mainland and through COM’s Collegiate High School during the Fall 2017 and Spring 2018 semesters. An additional $27,000 in scholarships was awarded to 45 students last summer. Shayla Agbilibeazu, recipient of the Sedalia Elizabeth Beaver Memorial Scholarship, said she was grateful for the life-changing opportunity to attend COM’s cosmetology program. A mother of two who found herself unemployed, the scholarship allowed her to start over and gain a new profession. “As a board member of the College of the Mainland Foundation, I see many of the scholarship applications for the programs offered at COM. The donations received from industry and the public go a long way in helping many students earn their degree. All you have to do is read a few of the thank you cards from the scholarship recipients to want to continue to support the Foundation. I’m proud to be associated with a company that supports both the educational process and in hiring the PTEC grads,” said Mark Perry with Marathon Petroleum Company. The Thank You theme at the luncheon also was extended to Tammy Stafford, scholarship specialist, who makes sure the students stay on track to complete their scholarship applications. 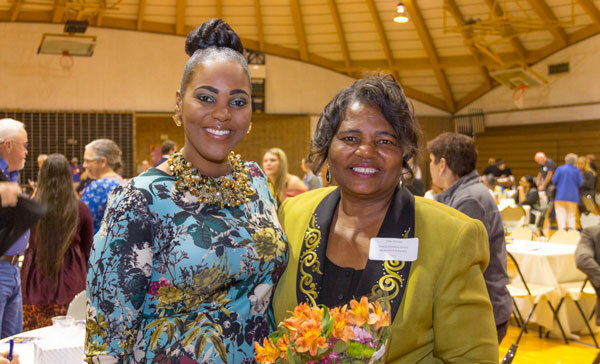 Shayla Agbilibeazu (left), recipient of the Sedalia Elizabeth Beaver Memorial Scholarship, standing with Tillie Henson (right).